When I started botanising, I couldn’t understand why some botanists followed orchids to the exclusion of other plants. Other flowers still appeal to me: the lipped ‘face’ of a labiate or the elegant symmetry of a pea flower, however large or small, for example. Yet, I too have been drawn into orchids. Their beauty is one very good reason. Their life style, is another, such as how the seeds combine with a fungus and how this means they can thrive when the living isn’t easy. The intellectual challenge of separating the similar species and how they vary from flower to flower is another. I have two favourite places for orchid hunting. One is ‘Spili bumps’, more properly the Kedros foothills, on Crete. The other is the meadow at Castang in the Dordogne. Our gallery of pictures of orchids in the Dordogne has been in place for a while, and this web page is to give more information about these flowers, and where and when we see them. It’s in two parts – orchids at Castang, and orchids we see elsewhere on the Dordogne holiday. In the picture on the right, it looks like a large lawn by our holiday base – and Keith and Cathy’s home – at Castang. The biggest part of the meadow runs down the hill left from here – see picture below. We’ve known since our first visit in 2001 how this meadow is wonderfully wildlife-rich. A more recent discovery is that when left uncut in spring – as it is nowadays – the area next to the house is the meadow's very best bit. A hay crop is taken later, the traditional way to manage an unimproved meadow. Green-winged (or green-veined) orchid Orchis morio. Hundreds in Castang’s meadow, at their peak in early May when we arrive, and fading away by mid-May. Colour varies from deep pink to white, but always with distinctive green veins. Pyramidal orchid Anacamptis pyramidalis (right) The second commonest at Castang, with a succession of flowers through a long flowering season. Bee orchid Ophrys apifera (right). The best known of the three Ophrys orchids (bee orchid types) at Castang. Sepals vary from deep pink to white. Early spider orchid Ophrys sphegodes (below, left). Another early orchid to flower, fading fast by mid-May. Woodcock orchid Ophrys scolopax (below, centre and right). In the local area this southern species outnumbers bee orchid, especially on dry banks. Like bee orchids, the sepals are usually pink but sometimes white, with a variable pattern on the lip. Also on the lip, note the 'goatee beard' impression. Lizard orchid Himantoglossum hircinum Lots of stumps in bud, but typically not out during our stay (2011 excepted). The photo here was taken on the ‘two views walk’ at Berbiguières, flowering a little earlier. Long-lipped serapias Serapias vomeracea (below, right) It was a great surprise to find this southern species several years ago near the Gouffre de Proumeyssac, then a great delight when it became a regular at Castang as soon as the top part of the meadow remained uncut. Tongue orchid Serapias lingua Quite common, usually growing in little patches. Noticeably smaller and less robust than the long-lipped serapias. Loose-flowered orchid Orchis laxiflora A few in the damp areas at the bottom of Castang’s meadow. Jersey or lax-flowered orchid are other names, the former showing the only place they can seen in the British Isles. Burnt-tip orchid Orchis ustulata Several in the meadow. A typical flower resembles a tiny lady orchid's flower. In some places we've found almost white specimens (right); in places they grow in great patches. Man orchid Aceras anthropophorum Usually several fine specimens close to the house at Castang (below, left). Military orchid Orchis militaris Occurring in only two places in the UK, our timing is spot on to see these in a couple of different meadows away from Castang, but also back at base since 2012. Lady orchid Orchis purpurea In flower early, not in the main meadow but on the edge of the wood and elsewhere very close (below, right). Our week in the Dordogne has a compact itinerary so none of these are far away. Click on their names for a picture - there wasn't enough space on this page to show them all. Also called sword-leaved helleborine, these are common in woodland edge. Like lady orchid, they could be added in to the 'Castang 13' if you include the little belt of woodland between the meadow and the road. White helleborine Cephalanthera damasonium We found this a short walk from Castang for the first time in 2010. Common spotted orchid Dachtylorhiza fuchsii One of the scarcest, despite being well-known in the UK, in a meadow at Roque St Christophe. Violet birdsnest orchid or limodor Limodorum abortivum Common in open scrub or woodland edge, especially above Berbiguières. Birdsnest orchid Neottia nidus-avis So brown it can be tricky to spot among the fallen leaves in woodlands. Bug orchid Orchis (coriofora) fragrans A tiny southern species of orchid, typically in bud on a dry slope at Roque St Christophe. Sombre bee orchid Ophrys fusca A good patch of this tiny, southern species is near the Gouffre de Proumeyssac. Despite its name, a subtle beauty. Monkey orchid Orchis simia Hit and miss - one of the trickiest to find. Greater butterfly orchid Plantanthera chlorantha Quite common in certain open woodlands. Early purple orchid Orchis masculata Scarce, or rather mostly over by mid-May, but there are usually a few in deep shade at Roque St Christophe. Common twayblade Listera ovata In several places, including a short walk from Castang. White helleborine We found this a short walk from Castang for the first time in 2010, the second time we've recorded it on the holiday. After a dry winter and long hot spell in early spring in 2011, lizard orchids were fully in flower in Castang (right) and there were red helleborines (left) on most walks, including on foot from Castang. We usually see leaves of broad-leaved helleborine, almost flowering in 2011. Marsh helleborine is reported near Les Eyzies. Dark red helleborine we found in bud in 2013. Like violet helleborine, also possible, it' s a later flowering species. Bob Gibbons reports frog orchids – an orchid Honeyguide seen in the French Pyrenees (right). Robust marsh orchids were in The Lot; maybe there are other marsh orchids, perhaps in late May/early June after we visit. Could there be lesser as well as greater butterfly orchids? A few ideas to prompt anyone with time to explore! This web page is meant to be looked at alongside our Dordogne orchid gallery; for some, you can click through to gallery pictures. A strange woodcock orchid and hybrid monkey x lady orchid: photos here on Facebook. Lady x military orchid here on Facebook (photo by David Simpson). 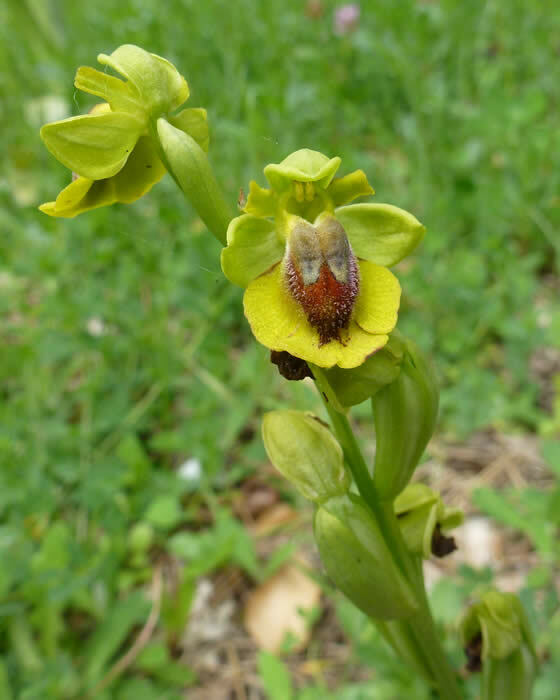 Yellow bee orchid in the Dordogne — common farther south, but a surprise for our 14th group based at Castang in 2013. There are many books on orchids but this is the book: Orchids of Europe, North Africa and the Middle East by Pierre Delforge (A&C Black) (click here for more info). But you don't need it for the Dordogne: most species are in Fitter, Blamey & Fitter and other British wild flower guides. 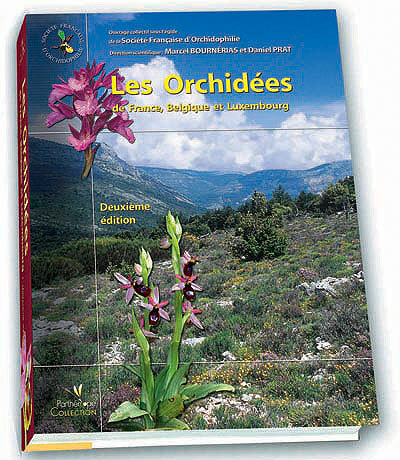 Les Orchidées de France, Belgique et Luxembourg by the Société Française D’Orchidophile (Parthénope Collection), though written in French has a wonderful collection of photos and distribution maps by department. Look out for it in bookshops in France, but be prepared to be confused by species not in other floras, as well as various subspecies and hybrids. Early purple orchid and common twayblade. Both well-known in the UK and not in our Dordogne orchid gallery pages. Photos on this web page by Chris Durdin, all except frog orchid taken in the Dordogne.